Citation Information: J Clin Invest. 2015;125(5):2151-2160. https://doi.org/10.1172/JCI78963. Identification of biallelic mutations in PARN. 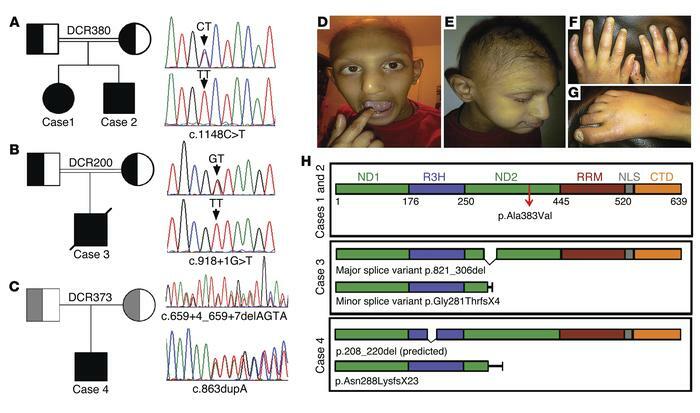 (A–C) Sanger sequencing traces confirm the presence of the mutations identified by exome sequencing in cases 1-4. Pedigrees are also shown. A representative trace of the variant is shown for parents and cases. The gray shading of the parents in DCR373 indicates that they are predicted to be heterozygous. (D–G) Photographs of case 3 showing some of the clinical features: (D) abnormal dentition and abnormal facial features, including dysmorphic ears and microcephaly; (E) sparse hair, (F and G) nail dystrophy. (H) A linear diagram of the PARN protein shows functional domains and the effect of mutations identified in cases 1-4 giving rise to relevant protein variants. ND1 and ND2, nuclease domain 1 and nuclease domain 2; R3H, conserved arginine and 3-histidine containing domain; RRM, RNA recognition motif; NLS, nuclear localization signal; CTD, C-terminal domain.